Our Pickleball Rocks team is proud to announce the latest edition to Pro-Lite Sports line of super paddles. The Rocket XL has unbelievable power but is almost whisper quiet. Everyone is talking about the new Polymer cored paddles hitting the market and the Rocket XL is king. Weighing in around 8 ounces, it is perfectly balanced so it is easy to swing, even though you don’t need to swing it hard at all to get those nice deep baseline shots. We believe the world is going to absolutely love this paddle and can’t wait to get one in your hands. We are so excited for you to try the Rocket XL that we are doing an introductory sale price (a full $10 off Pro-Lites MSRP) of only $74.95 and will send it to you FREE of any shipping charge, while our supply lasts. Have fun with this new SUPER PADDLE. Charlotte, NC, here we come! Who is coming with us?!? !The USAPA Sanctioned Atlantic South Regional Pickleball Tournament is coming to Concord, NC (right outside Charlotte) Thursday March 19 – Sunday March 22, 2015 and you won’t want to miss this one! This tournament will be held at the beautiful Carolina Courts on 16 indoor courts! Junior Doubles and Juniors Mixed Doubles!A social meet/dine is planned for Thursday March 19th at 7:00 pm…location to be announced. Registration is open and closes on March 1, 2015, so get your registration in early! 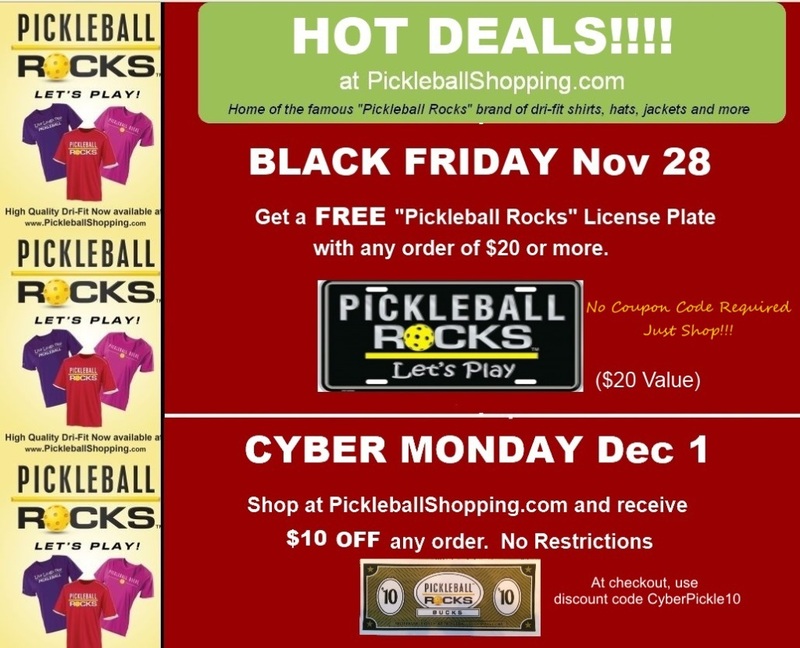 Online registration is available at www.pickleballtournaments.com. Online registration ONLY. No paper forms. You can pay using a credit card through PayPal even if you do not have a PayPal account. Hope to see folks from all over the US at this tournament! It’s going to be a great event!! 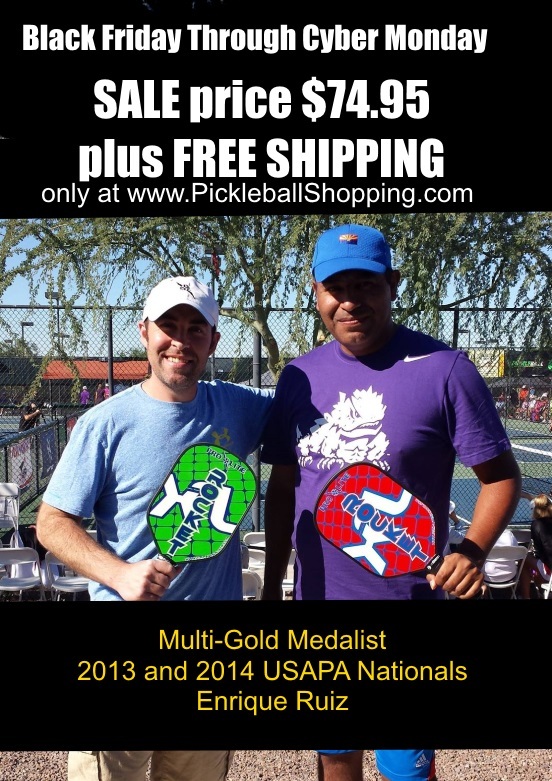 The greatest week in pickleball has wrapped up and everyone left raving about the experience. 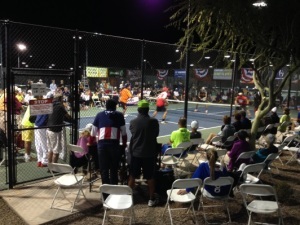 One huge vendor tent combined with 28 courts and almost 700 players, plus dozens of Sun City Festival Pickleball Club and USAPA volunteers created the most spectacular tournament in pickleball history. After watching players aged eight to eighty play over 2000 matches during the seven days, we have come to one conclusion. It is great to play any time when you are at the National tournament, but if there is one goal that every pickleball player young or old should have, it’s to play under the lights. It is just special to see and feel the atmosphere at those matches that are played at the end of the day. If you are playing under the lights, it means pretty much everyone has lost except you. The crowd is totally focused on you, the music is blaring during the timeouts and the TV cameras are rolling. It means you have survived a long, hard day and a medal is likely coming your way. The matches under the lights are special. Think about the tennis US Open in New York at night. Yeah, it’s just like that, only better because you get to play in it. So make it your goal to play under the lights. It will be tough to do, but certainly worth the effort. Good luck in next years National tournament in Casa Grande.